The American mink (Neovison vison) is a semiaquatic species of mustelid native to North America, though human intervention has expanded its range to many parts of Europe and South America. Because of range expansion, the American mink is classed as a least-concern species by the IUCN. Since the extinction of the sea mink, the American mink is the only extant member of the genus Neovison. The American mink is a carnivore which feeds on rodents, fish, crustaceans, frogs, and birds. 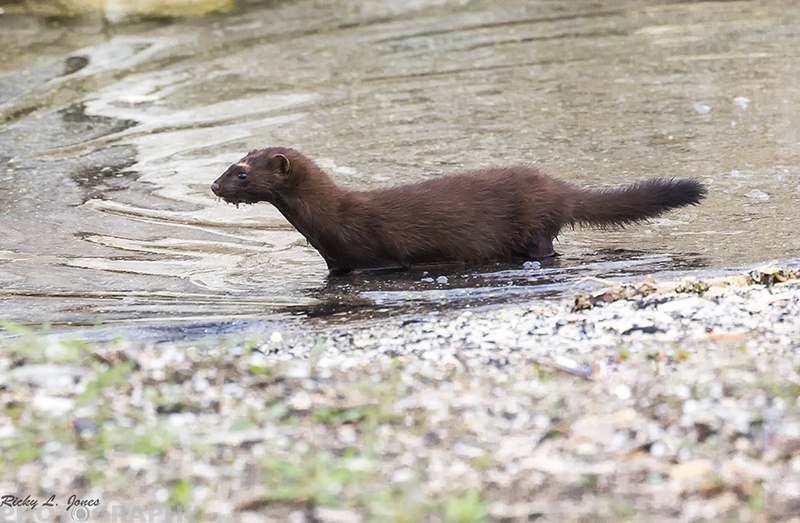 In its introduced range in Europe it has been classified as an invasive species linked to declines in European mink, Pyrenean desman, and water vole populations. It is the most frequently farmed animal for its fur, exceeding the silver fox, sable, marten, and skunk in economic importance. As a species, the American mink represents a more specialized form than the European mink in the direction of carnivory, as indicated by the more developed structure of the skull. Fossil records of the American mink go back as far as the Irvingtonian, though the species is uncommon among Pleistocene animals.